The Friends have undertaken funding various projects over the years to benefit the Eloise Butler Wildflower Garden and Bird Sanctuary. These projects are jointly worked out between the Friends and the Minneapolis Park & Recreation Board. These projects are funded from donations and memorials received by The Friends. The most recent projects are shown below. 1. 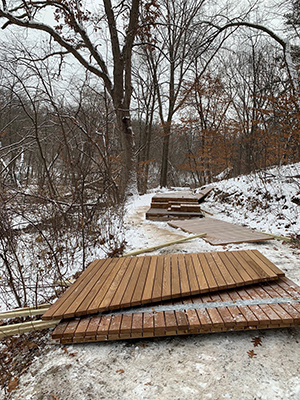 Completion of Phase II of the wetland boardwalk - Installation finished in April 2019. Funding provided - $21,200. Full boardwalk project details here. 2. Two planting projeccts - Native shurb planting between Geranium Path and Lady Slipper Lane - $4,000 estimated. Prairie plantings in the intensively managed prairie garden areas (as result of invasive control 2015-2018) - $3,500 estimated. 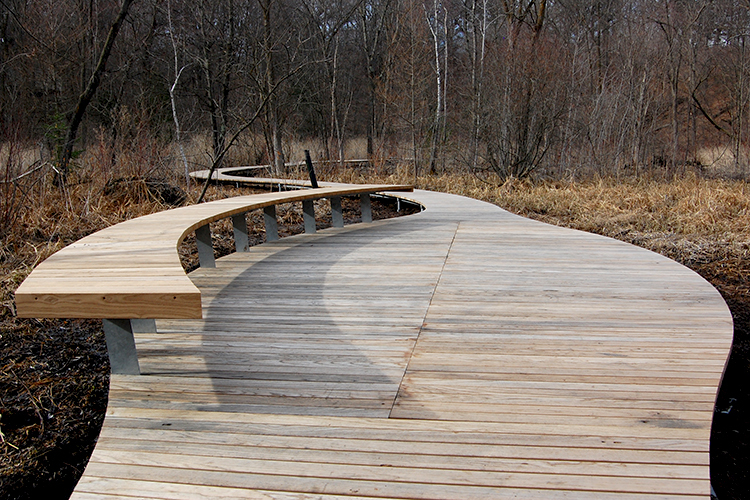 Below: Completed phase II of the wetland boardwalk. 1. 2018 installment of invasive plant control and habitat restoration in the prairie and wetland - $3,469. 2. 2018 Component manufacture of Boardwalk sections - $50,765. 3. Student Transportation Grant Fund subsidized 560 student Garden visits. Cost $2.040. 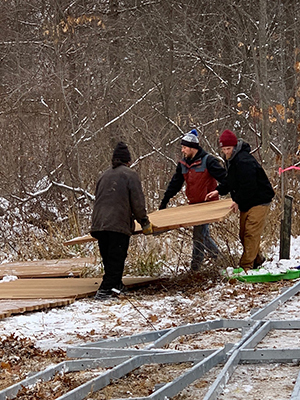 Below: Delivery of phase II boardwalk section in late November 2018. 1. 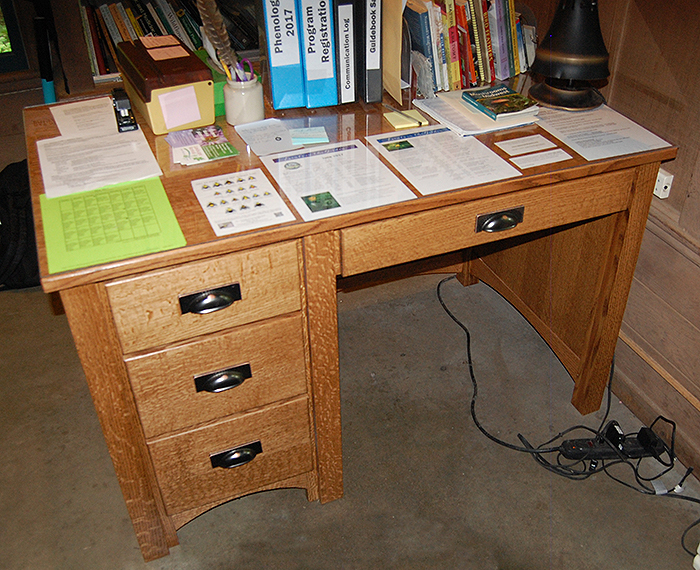 Completion of the new desk for the Shelter - Quartersawn white oak. Final cost $1464. 2. 2017 installment of invasive plant control and habitat restoration in the prairie and wetland - $3,500. 3. Student Transportation Grant Fund subsidized 525 student Garden visits. Cost $2.040. 1. Student Transportation Grant Fund that subsidizes transportation costs for bringing school age children to the Garden for nature study. This year we provided $2,358 for transportation of 13 classes - 635 students. 3. Miscel. projects: Deposit on construction of a new desk for the Martha Crone Shelter - $500; kids backpack project - $139; support for Friends Invasive Plant Action Group - $192; Shelter furniture upkeep - $162. 1. The Friends funded the purchase of 100 native trees and shrubs, planted by the Garden staff in an area adjacent to Geranium Path where a number of Ohio Buckeye have been removed. The Buckeyes have become far too numerous. This is also the area where there was storm damage from the 2011 tornado. Cost - $2,042. (Details). 2. The Student Transportation Grant Fund provide support to one school. 3. The Cary George Wetland Project boardwalk was installed July 6 to 23rd. It was funded over the past three years. A section design that replaces the current bridge is shown below. Costs of $75,000 (The Friends portion) were placed in 2014. Details. 4. Invasive plant control: The Friends funded the removal of sumac, wild raspberry, Reed Canary Grass and volunteer trees in the prairie area. In the wetland and woodland area, we are funding the removal of recently grown buckthorn, spot spraying of Reed Canary Grass. Total cost of the project, completed in November and early December was $5,150. 1. Design completion was finalized and construction bidding of the Cary George Wetland Project is in process. After several years of planning, construction will occur in the summer of 2015. (see details below in the 2013 report). We are continuing to raise funds for this project. $75,000 has been deposited with the Minneapolis Park & Recreation Board thus far and we believe additional funds will be needed. Thanks to all who have contributed thus far. 3. A $500 grant was made to Minneapolis Audubon in assistance for a video explaining the effects of the new glass used on the Minnesota Vikings Stadium. The Friends of the Wild Flower Garden have approved two new projects for 2013 and the continuation of one project from 2012. 3. CONTINUING: The Cary George Wetland Project. This major wetland project of creating a boardwalk to replace old deteriorating bridges has involved a wetland survey, design considerations, and the need to move some rare plants. Design work is in process and the start of construction may begin in 2014. Estimated cost - $100,000 -$150,000. The Friends and the MPRB are jointly funding this project. MPRB is providing $43,000 via a gift received for the Garden and the The Friends must fund the remainder. Our initial contribution in Oct. 2013 was $25,000. Detail of all funding from past years.